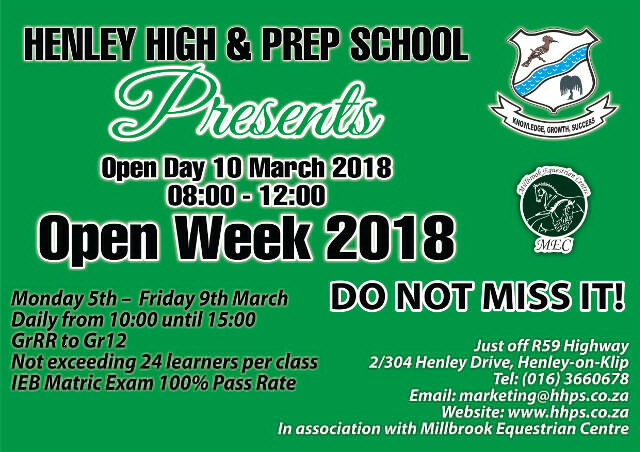 We will be having a little Open Day at Millbrook on Saturday, 19 January, from 10am to 12:30pm to give your child the opportunity to come and view the riding school, meet the ponies, have a little ride, chat to Aunty Wendy about the ins and outs of riding and get more information on riding lessons. There will be a cold drink and packet of chips for your child and a carrot to give to the ponies. Please come along. Please email me on marketing@hhps.co.za should you require any further information. 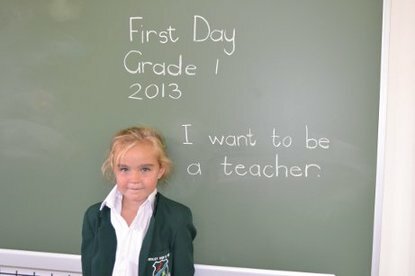 Our 2017 Matrics pass with flying colours! A hearty congratulations to our Matrics of 2017 who passed Gr12 with flying colours. 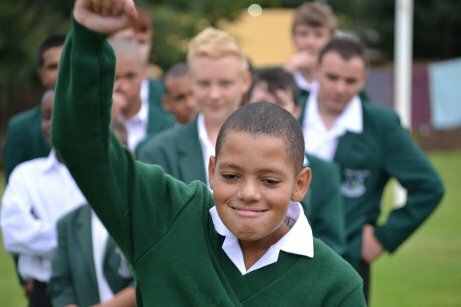 We are delighted to announce that they achieved a 100% pass rate with 80% University Degree entrance. 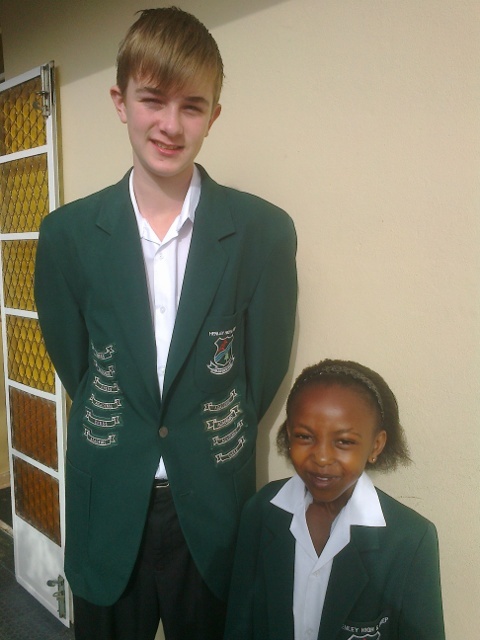 Out of a group of 10 Matrics, they achieved 10 distinctions between them. Wishing you all well on your way into your bright future! 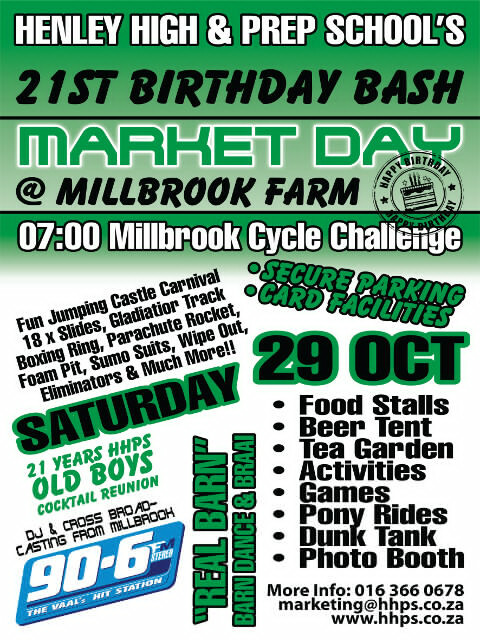 Come along to Millbrook Farm and join in all the fun! 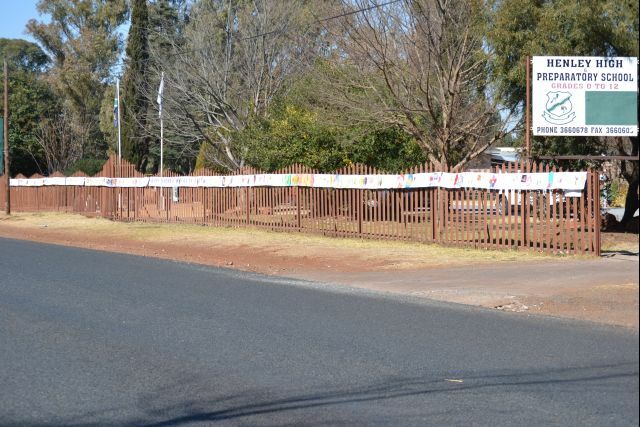 Hearty congratulations to the matrics of 2015! 100% pass rate, 100% University entrance! 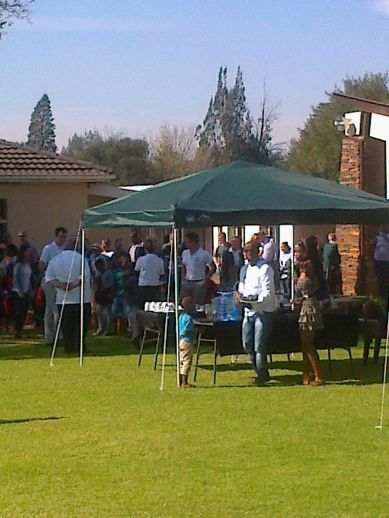 Our recently held “Open Day” was a massive success – attracting many prospective learners for 2016 from near and far. 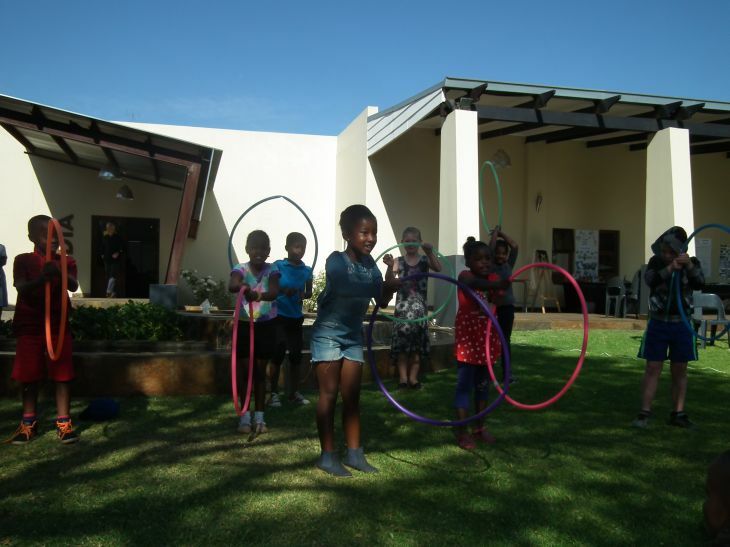 Activities for the day included Boeresport, Talent Shows, Choir Practice, Cooking Class, Recital of Shakespeare, Netball Clinic, Soccer Clinic, and many other classes and exhibitions. This year’s Open Day marked the foundation for the promise of exciting upcoming prospects and growth and instilled in everyone a sense of positive and vibrant expectancy for 2016. 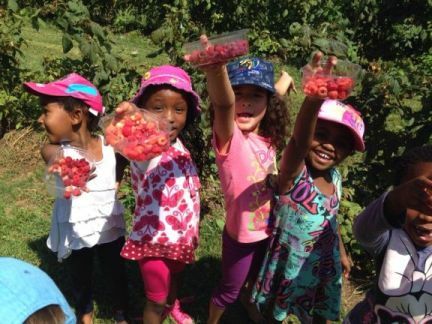 The Gr R’s and Little Stars of Henley Pre-Primary recently visited the Just Darling Berry Farm in Walkerville. The kids loved the day picking and eating berries. They were rewarded with a yummy raspberry smoothie after a hot day in the fields. 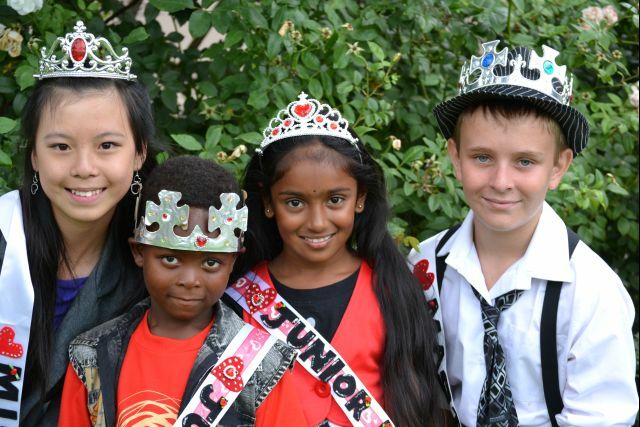 2015 has been a fruitful year for the HHPS chess team. Eleven of our players qualified for the Sedibeng team and two of these, Vangile Nhlapo and David Smith, entered the individuals at the SA’s. Both made it into the SA Top 20, only missing the SA team by a few points. 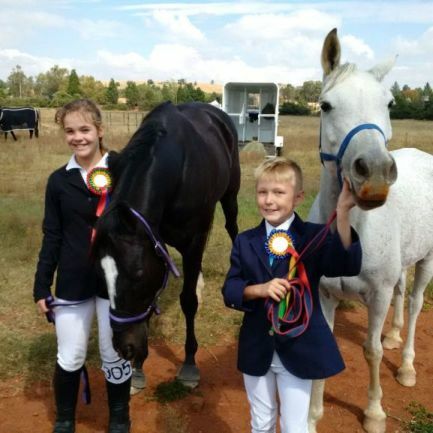 The 5 members of the HHPS Horse Riding Team Erin Price, Megan de Lange, Mackenzie Poulter, Tanna Frankisch, and Joshua Neve all participated in the SANESA 3rd qualifiers. They all did extremely well and have made it through to the next round with the goal being to achieve a place in the Sedibeng team. Seen here are Tanna Frankisch and Joshua Neve. 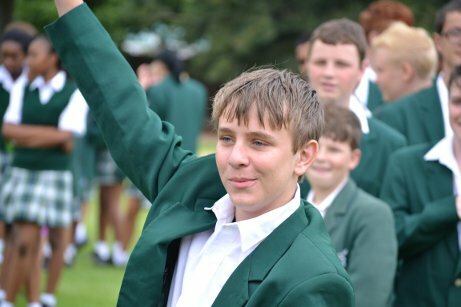 Term 1 ended with a bang as the entire school was gripped with a combination of Easter Madness and Holiday Fever!! The Primary School enjoyed a relaxing picnic under the trees with their buddies. The Middle School had all kinds of fun from playing Hangman, Balloon Games to ‘’Onder-handjies klap” and lots of other exciting games. 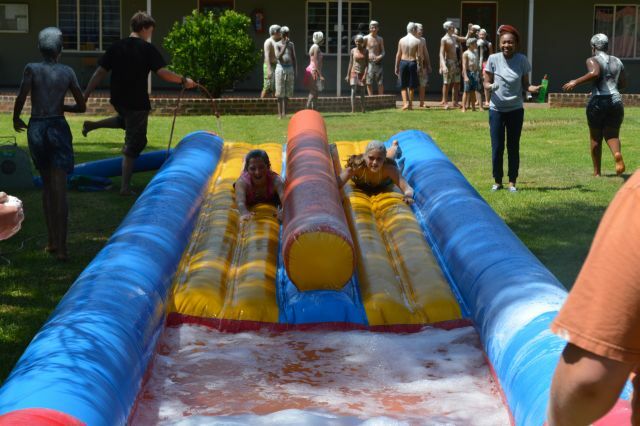 The High School had a Boeresport House-War: River vs Hoepoe consisting of cheerleading, egg races, wheelbarrow races, toffee apples-flour and syrup on your faces, water fights, and tons more. The staff had a funny bunny day and hopped around joining in all the fun! 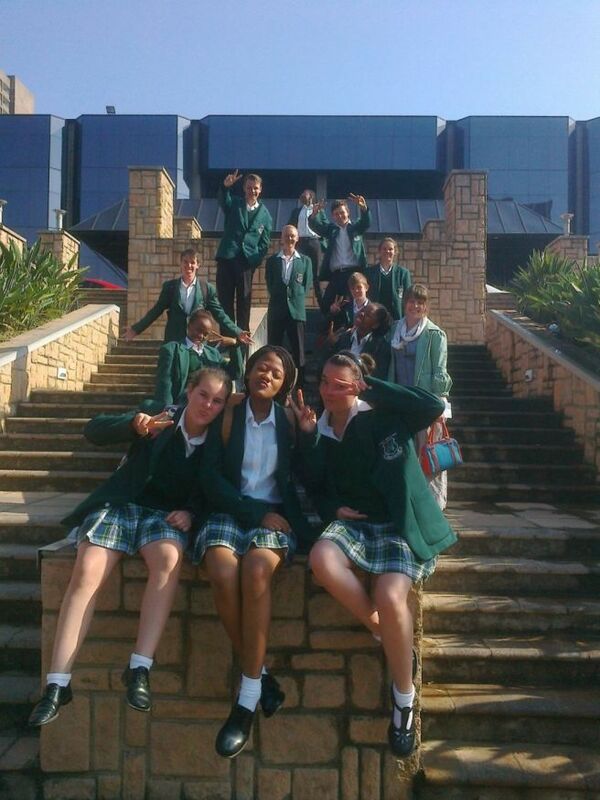 The Grade 10’s braved it on a trip into Johannesburg Centre to watch a play of their set work book Animal Farm. It was extremely informative and believe that it will help immensely with the understanding of the book. 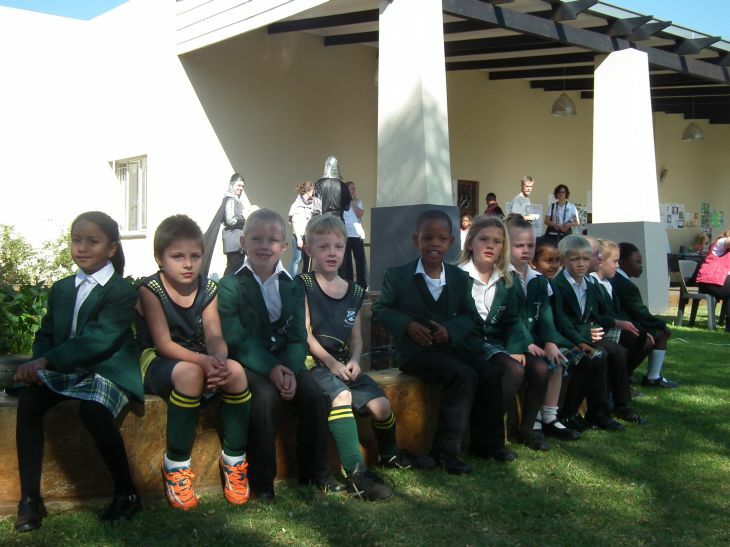 Both athletics and swimming season went off well this year in the Primary School as well as the High School, with a series of galas (including Interhouse and Interschools) and various athletics meetings. Interacting with schools on these levels really raises the individual child’s expectation of him or herself and gives the child an opportunity to express themselves and grow in an environment outside of the classroom. 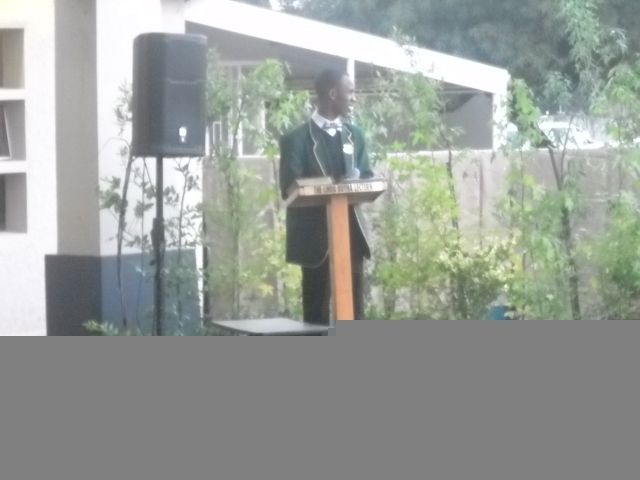 Congratulations to all our matrics of 2014! 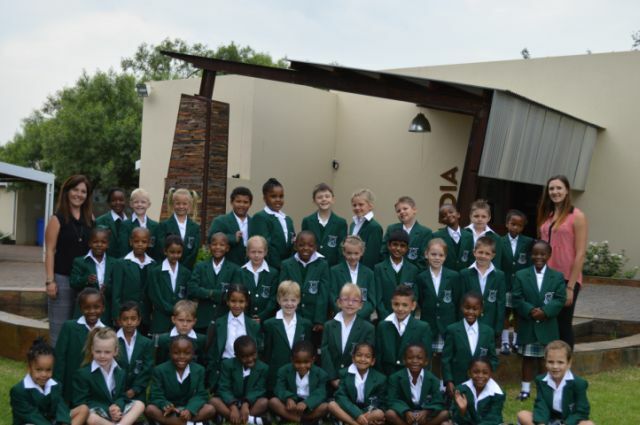 A hearty welcome to our Grade 1 Class of 2015! 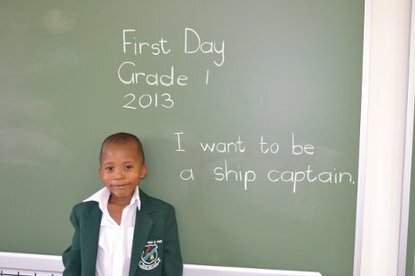 May they learn, play, prosper and - through the years to come - become who they were created to be. 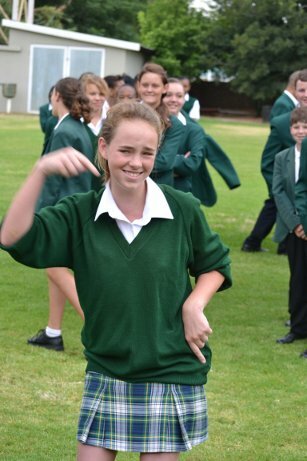 On 16 January 2015, the Grade 8’s embarked on our Orientation Weekend under the leadership of the Grade 12s. Games started in the hall consisting of 'Pose like a….banana', 'Shoe/Squat', and 'Amazing Race'. We then went and swam and went on a slippery slide. We dried off and practised our house plays a bit. After a hamburger supper, it was pretty dark so the Grade 12’s taught us how to play k 'Stalk the Lantern'. What you have to do is find the lantern and capture it and take it to your starting point without being seen or caught. We were the stalkers first, the funniest part for me was when you hide and a matric comes and looks right at you but doesn’t see you. The Matrics then called us and said they will be the stalkers because we couldn’t get their lantern. We then got into position and watched. 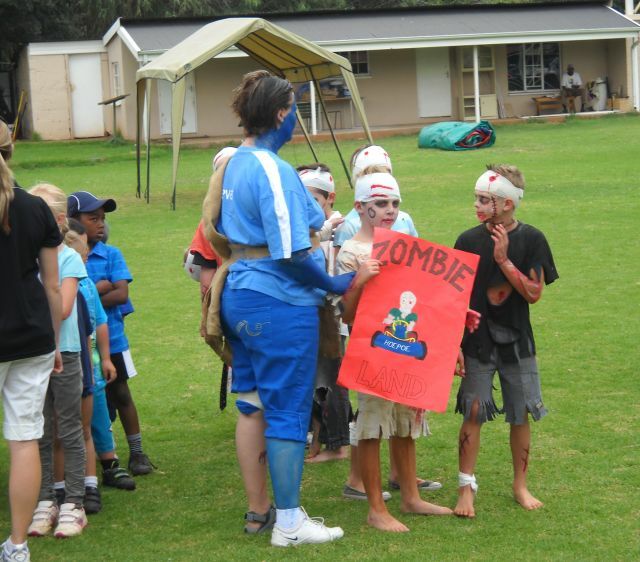 We held off the Matrics for quite a while but they got our lantern eventually. 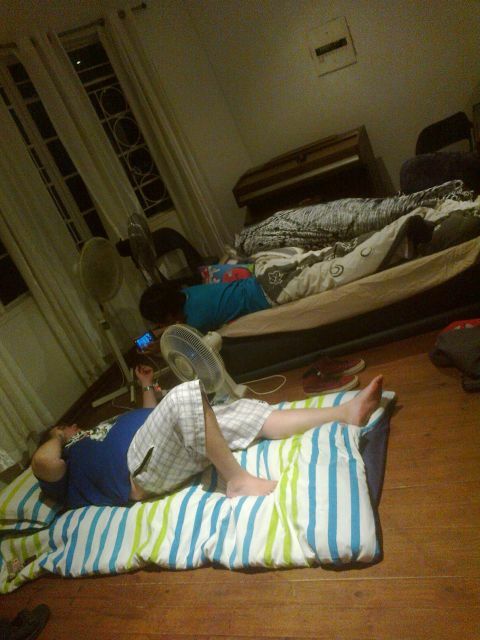 After being tired out, we went to fetch our bags and got ready for bed. 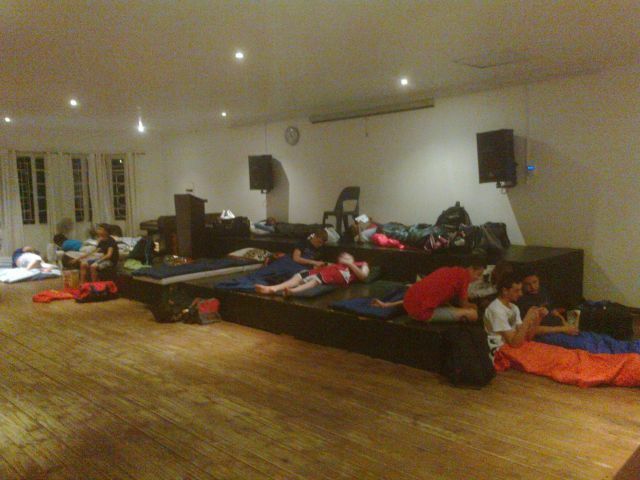 The boys slept in the hall and the girls slept in the media centre. 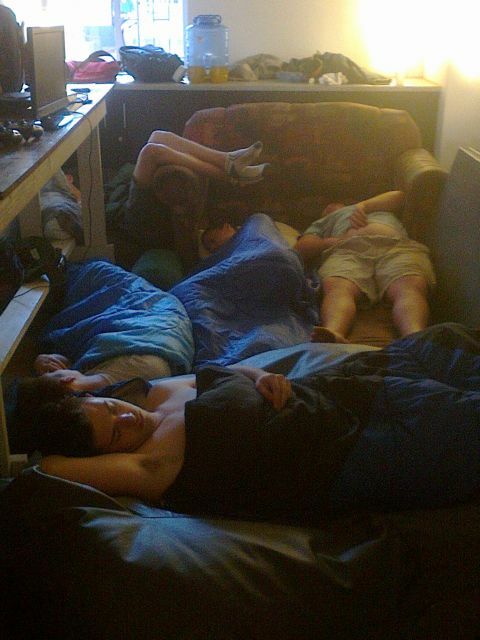 It was a rather peaceful night except for the Matric boys tickling our noses with tissues at around 2am. At 6am, we woke up and had to do exercises on the field. The Gr 8 Hoepoe team served Cornflakes for breakfast. 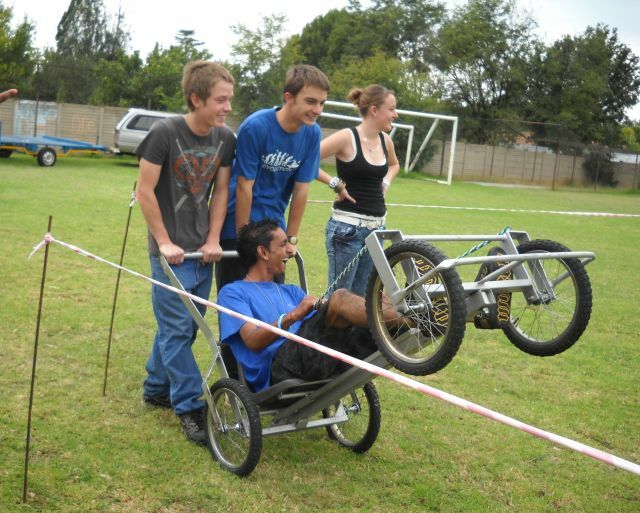 Then the Matrics set up the obstacle course. 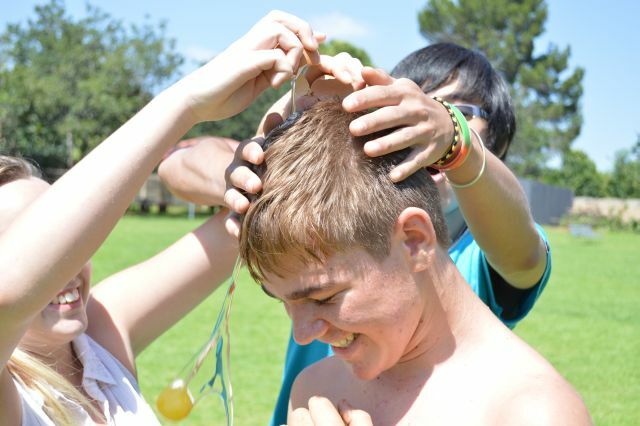 It was a very eventful course including crawling through mud and having an egg cracked on your head, followed by a flour shower. Back to the slippery slide and into the pool took care of most of the muck. We had hot dogs for lunch and practised our play again. We played volley ball and then relaxed for a bit, preparing for the main event of the weekend. 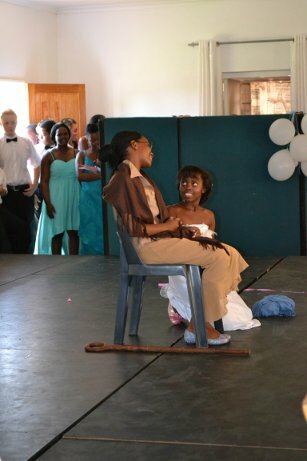 We had a bring and braai after which our parents were invited to join us in the hall, listen to a few speeches and to come watch the house play. After the play we all went up on stage and did our flag and our motto and a war cry dance. We went to the media centre to pack up and clean up. We then said goodbye to each other and left to go home one by one. 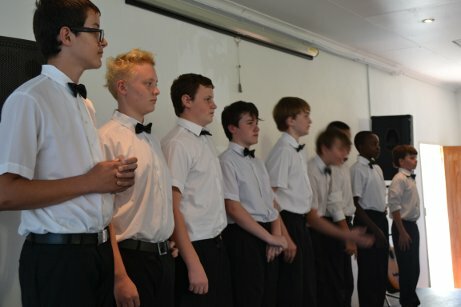 The first official school meeting of the year kicked off on Saturday, 10 January, where the Matrics came together to be informed of what their responsibilities would entail this year. 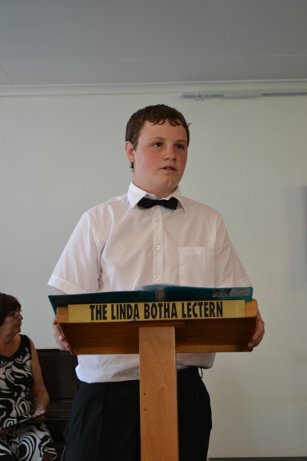 Mr Kingma has a very strong conviction that every individual in Matric has a role to play in the spirit, discipline and continuation of traditions within the school. The morning was filled with motivational talks by Mr Kingma and Mr Edwards, the planning and operations of the upcoming Gr8 orientation camp, some teambuilding games (including ‘People Noughts and Crosses’ and ‘Which Famous Person am I’? 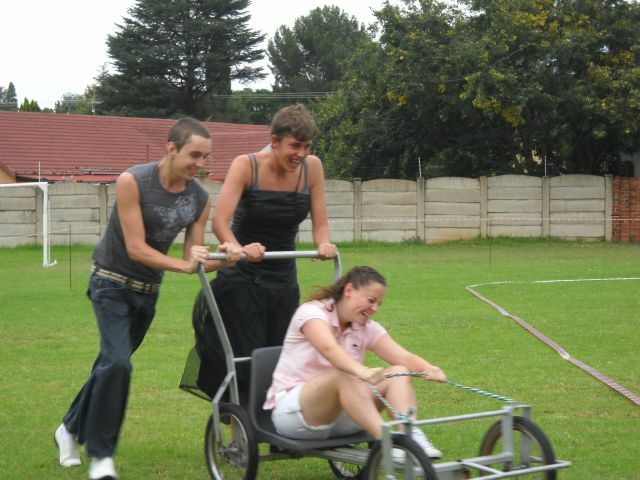 ), distributing of braiding for the Matric blazers as well as a delicious boerewors roll braai. 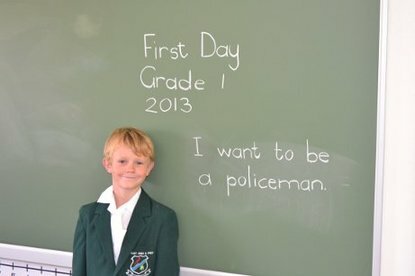 They are an amazing group of Gr12’s and the management and staff have faith that they are going to play a hugely active role in taking Henley High and Prep School to a brand new level of greatness. 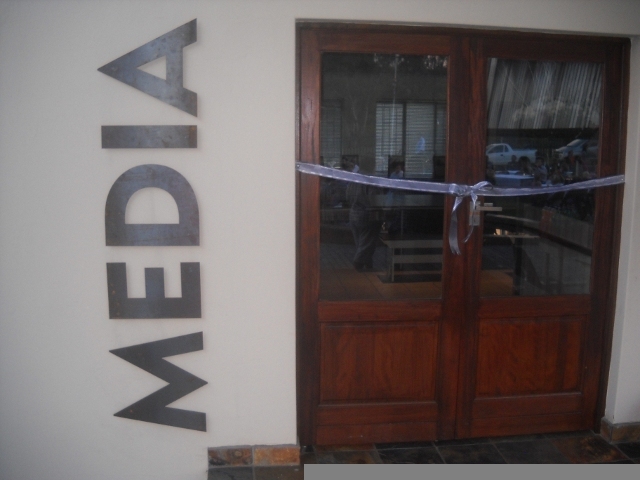 The opening of the new Media Centre was a huge success; about 250 parents attended to show their support. 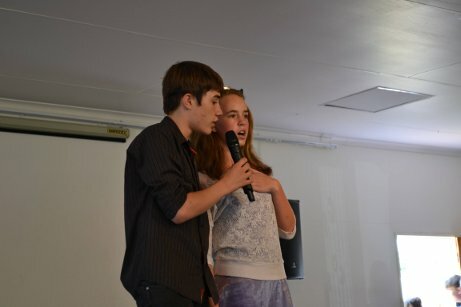 Everyone enjoyed a great variety show put on by our learners before the ribbon was cut and the doors officially opened. 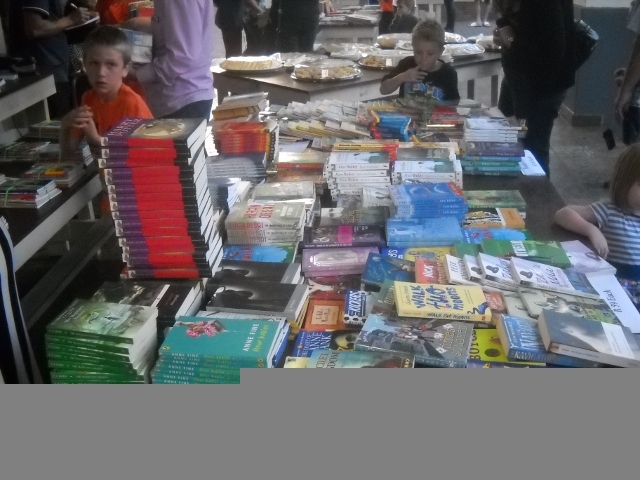 There was a large selection of books on sale which many of the parents purchased and donated to the Media centre. Many thanks go to Mrs Michelle Henderson (our Media Centre teacher) who coordinated the event, the teaching staff and learners - also to the Director/Owner of the school, Mr Eddie Edwards, Dr Jeann Dickinson (Head of School) and the Parent Forum for making all this possible. 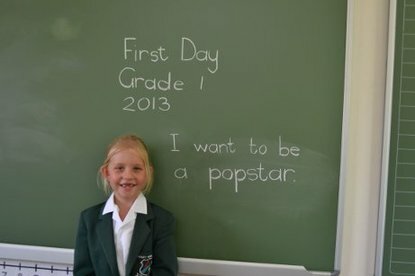 From pilots to popstars, HHPS has them all! We are very proud to announce that Henley High and Preparatory was chosen as Business of the Year in the Educational Category by the Midvaal Chamber of Commerce. 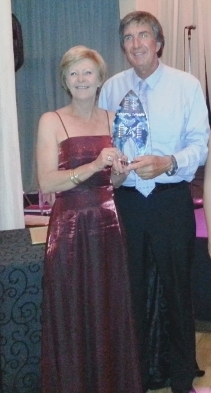 The prize was received by Dr. Dickinson and Mr. Edwards at a gala event held on the 15th of November at the Lords Signature Hotel in Risiville. Congratulations to our learners, staff and parents who all work together to make our school a success. 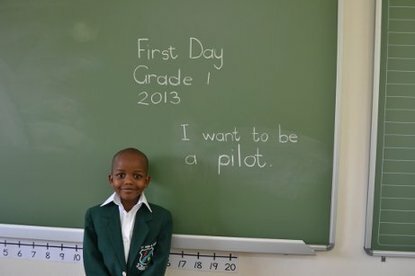 Kabelo Masitenyane one of our Grade 11 learners has been accepted by Rotary Youth Exchange as an exchange student and will be visiting Turkey in December. This will give him an opportunity to experience a new country and culture and widen his horizons. 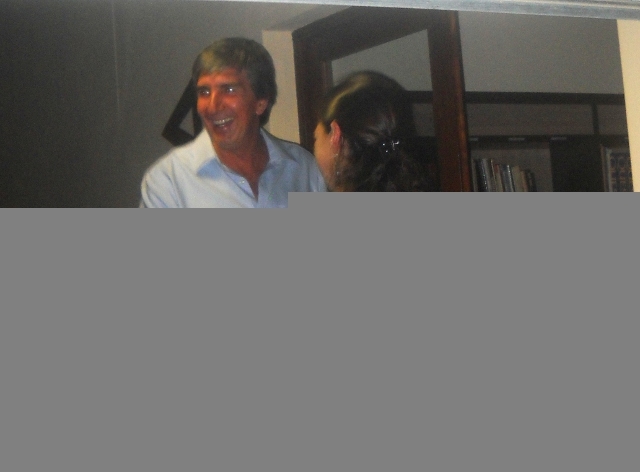 To assist with all the costs involved in the exchange program we will he having a Golf Day on the 27th of July 2012 at Meyerton Golf Club. Please click here for all information concerning the golf day . We are looking for sponsors as well as teams of players so any golf enthusiasts are encouraged to take part. I am thrilled to confirm that all 2011 matric students that wrote the National Senior Certificate IEB examinations passed - a 100% pass rate yet again! Congratulations to matrics, some of whom performed way beyond their goals and expectations and the Grade 12 staff on the achievement. 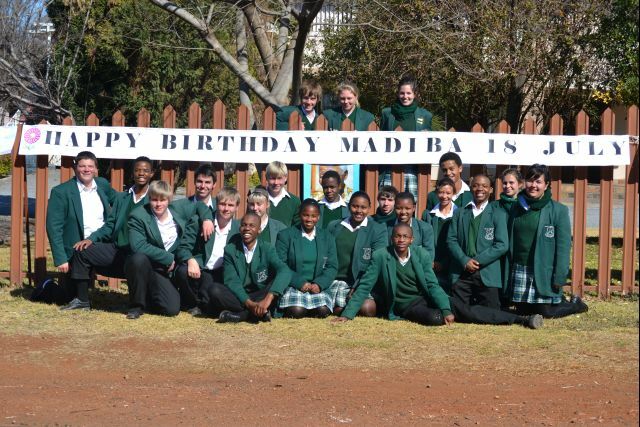 Thank you to all our pupils for the beautiful flower pictures made for Madiba’s birthday. A big thank you to the Parents Forum for organizing the event and a special thanks to learners and parents for their support. 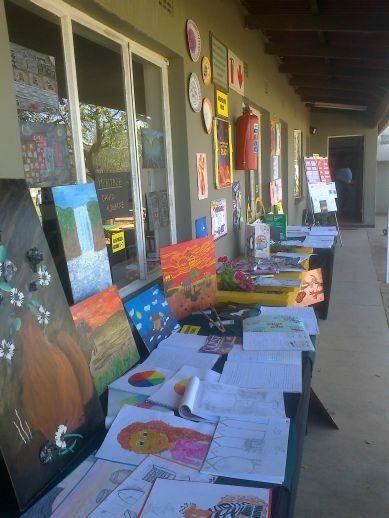 The event raised approximately R18000. Congratulations to Jarred Ras in grade 1 who raised the most money. 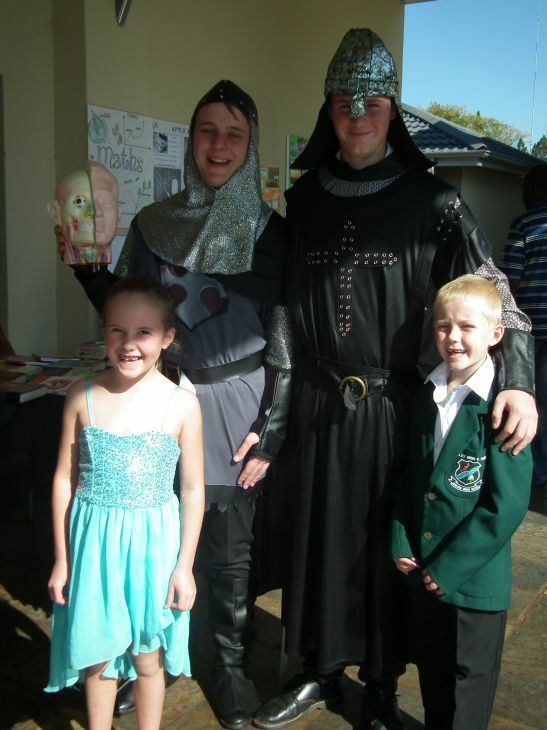 In the prep school grade 4's won the prize for best dressed and most money raised. In the high school the grade 11's won the most money raised. WELL DONE! There was loads of athletics action this month. 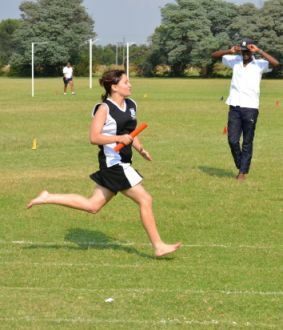 Henley High hosted a friendly athletics meeting with Assemblies of God College on 10 February. This was a very good practice run for all athletes and Henley High walked away with the win. 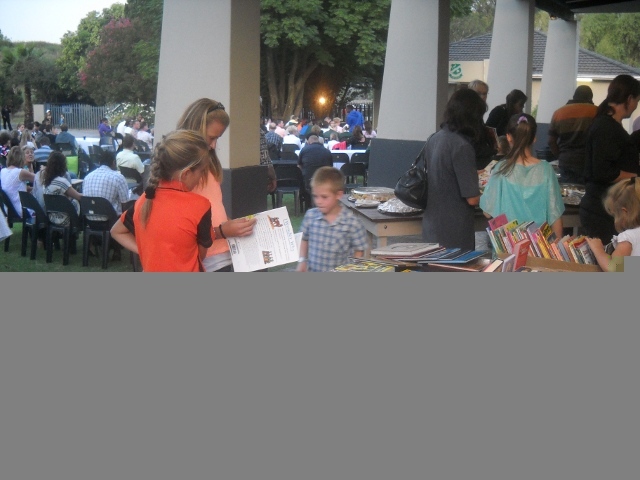 On 16 February the Inter Private Schools event was held at Greenacres. It turned out to be an exceptionally competitive day and once again Henley High gained the victory. Unfortunately the Cluster Schools athletics was rained out on Saturday 19 February, but this will be rearranged on another date. 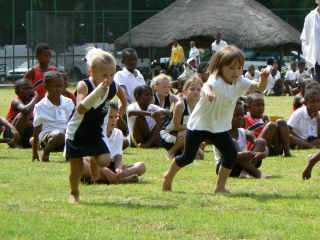 The Junior school have also had a great athletics season. 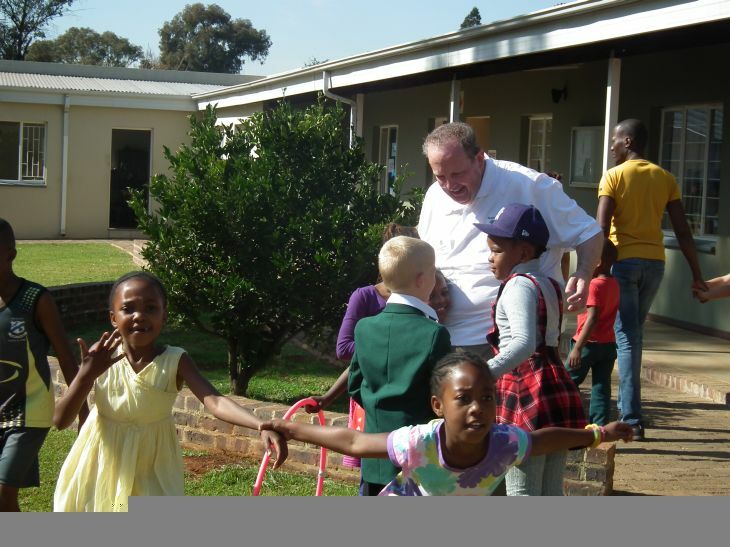 Our children took part at Meyerton Primary school and had a most enjoyable day. 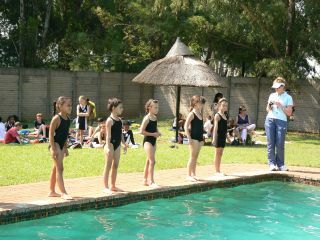 We went to DP De Villiers in Sasolburg for a cluster meeting and 12 children qualified to go to District championships. Daniele Barnes took first place in long jump and goes through to the regional championships. 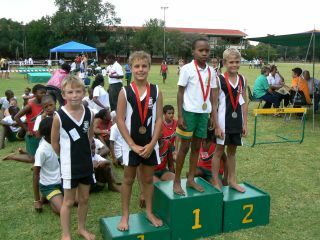 Raiden Pelzer came third in Long jump and also 5th place in 80m and 100m. 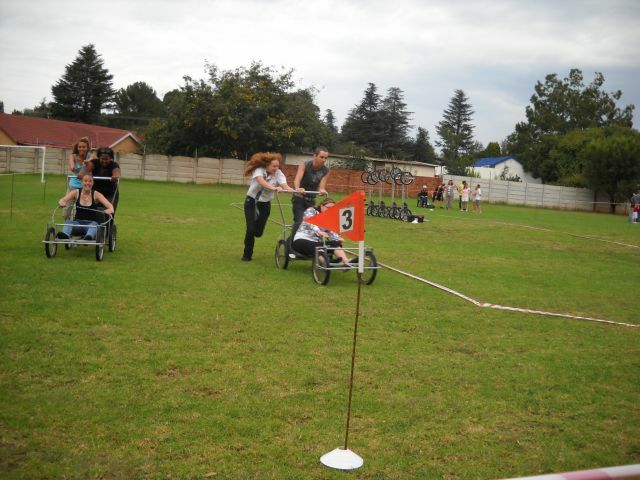 We are very proud of all our athletes and also all the learners who offered up their free time to support their team. 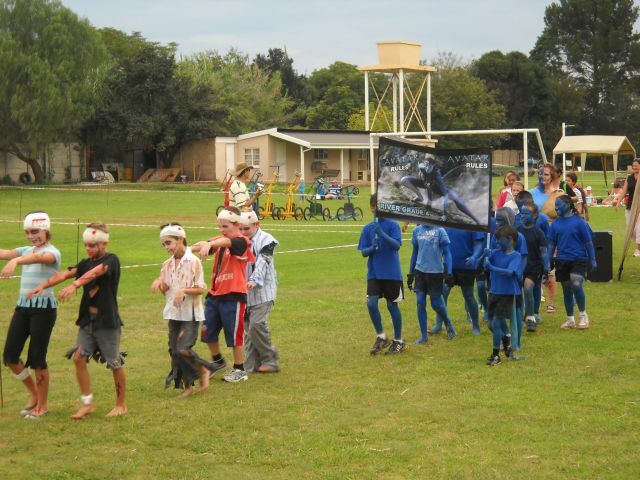 The highly anticipated and exciting Henley Prep Inter-House Gala took place at Bass Lake on 16 February. Being just a walk away, meant that the activities began long before the actual swimming. From the beginning, the gala was dominated by River, but Hoepoe refused to give up. In the end River did still steal the victory. Thank you to Mrs. Rosslee, Mrs. Hewer and Mrs. Baker for a well organized gala. Our thanks also goes to the parents for their help and support. Mrs. Firbank for timekeeping and Mrs. Dreyer with Mr. Da Silva who were our lifeguards. 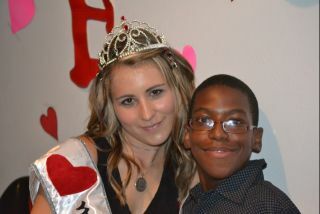 Henley High's Valentines Dance was held in the school hall on Friday, 11 February 2011. 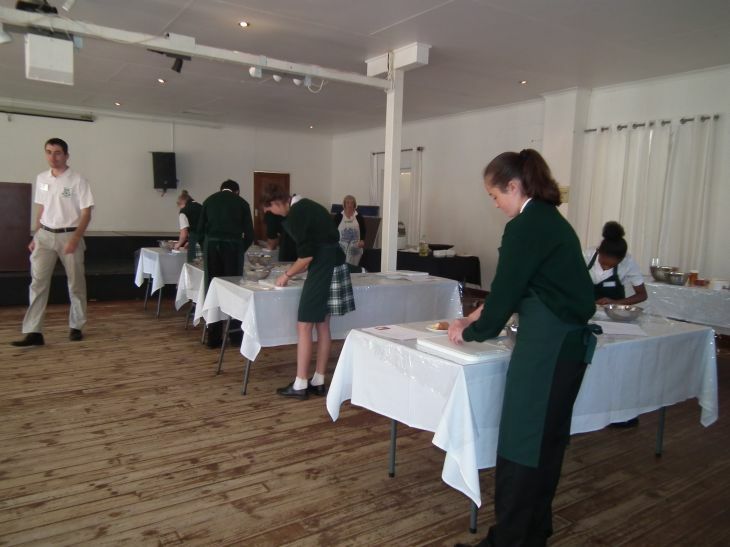 This event forms part of a Gr 11 Business Studies assignment. 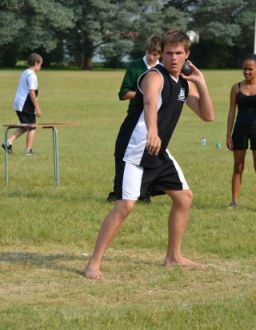 The Gr 11 class is responsible for all planning and marketing relating to the event. 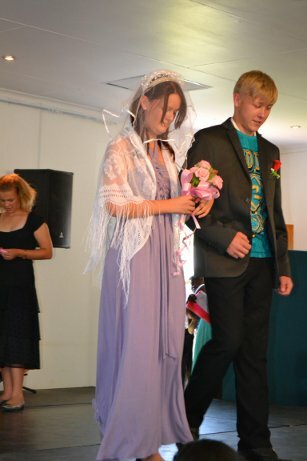 Alex Steenbeek was crowned as Miss Valentine with Thomas White stealing the crown of Mr Valentine. The raffle of a wonderful basket of delicious goodies was won by Kyle Alexander. There was also a treasure hunt on the school grounds and lots of other fun games. 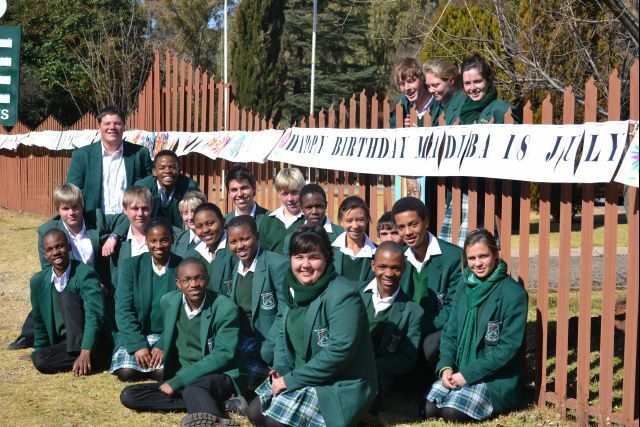 All the Grade 8 and 12 learners were taken to Bosco’s Youth Centre for a day of learning, bonding and fun. 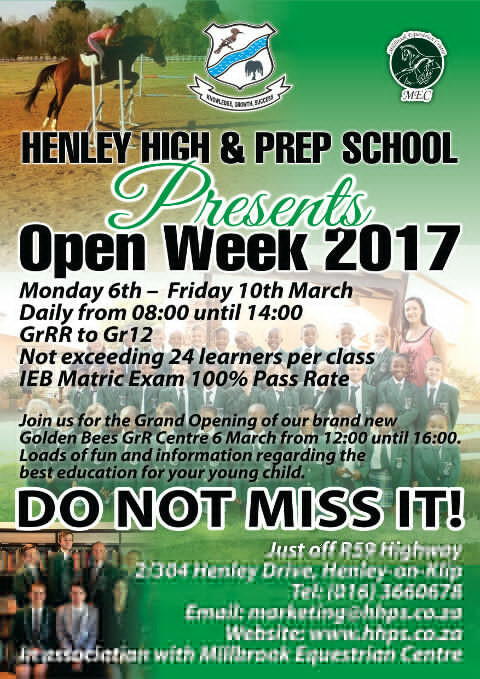 The aim of this outing was to unite our oldest and youngest learners in Henley High to forge a strong unit in the high school. 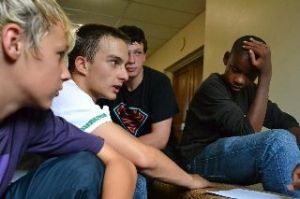 All the learners said that they had a gained a new understanding of each other by the end of the planned sessions. Rotary arranged a Golf Day on the 17th of February. 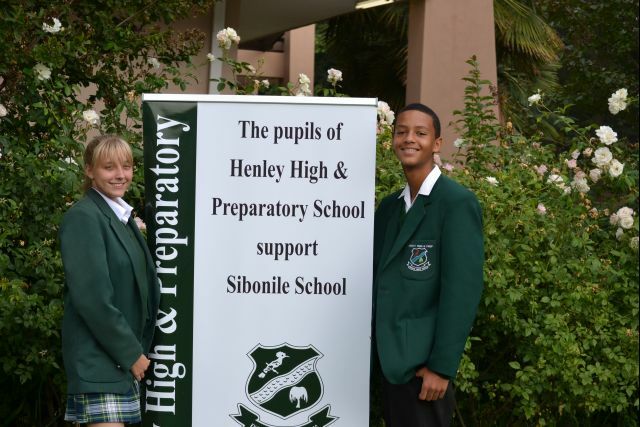 Henley High and Preparatory sponsored a hole in aid of Sibonile School. 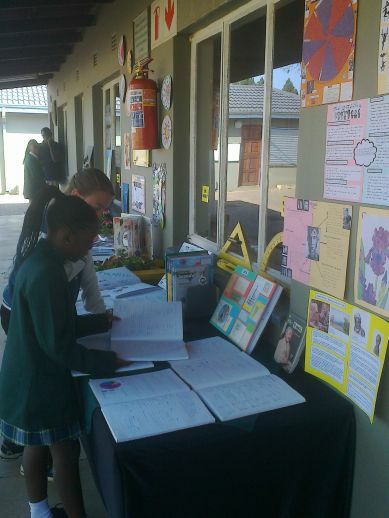 Sibonile School caters for pupils with visual impairment and is situated in Kliprivier. 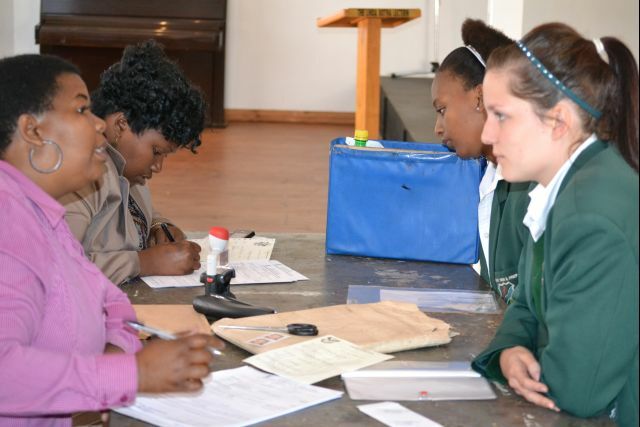 Home Affairs also paid a visit to Henley High during February to assist learners who do not have Identity Documents to complete their applications. Thanks to our hard working students and dedicated teachers our matrics received the following results. 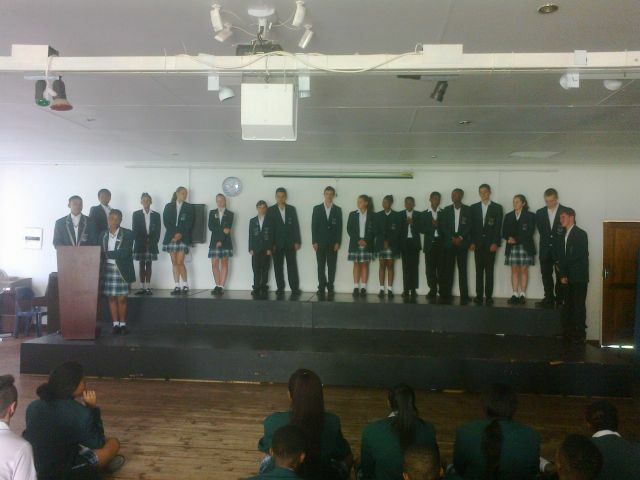 15 distinctions - well done!!! 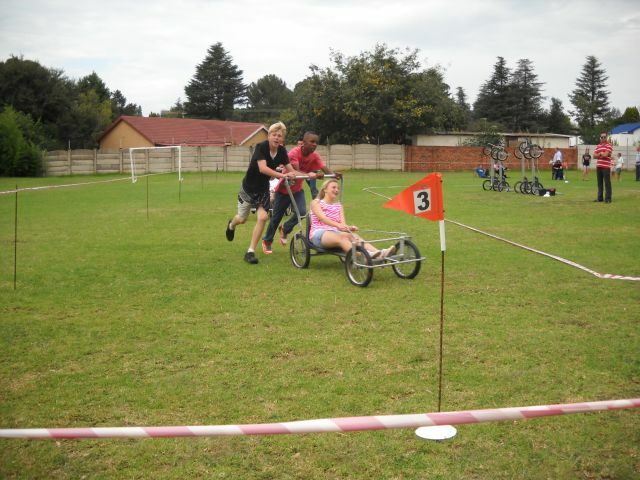 The Parent Forum hosted our first Soap Box Derby day on the 11th of September. It was well attended by the staff, pupils and parents. 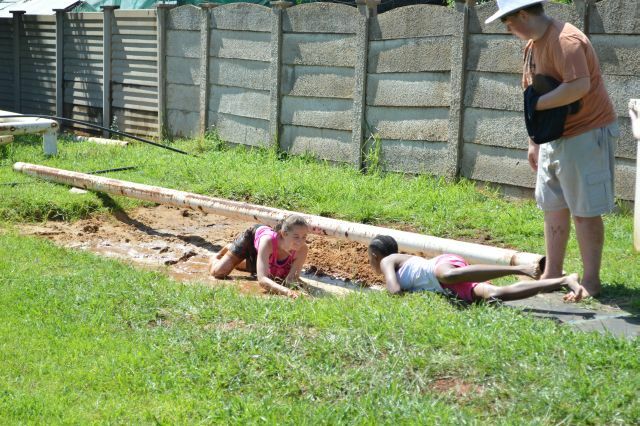 All the children from Grade 00 to Grade 11 had a chance to compete in a 20 minute session against each other to see how many laps they could do. Families also competed against each other and won a prize from Bass Lake as well as a family hamper from the Serendipity Farm stall. 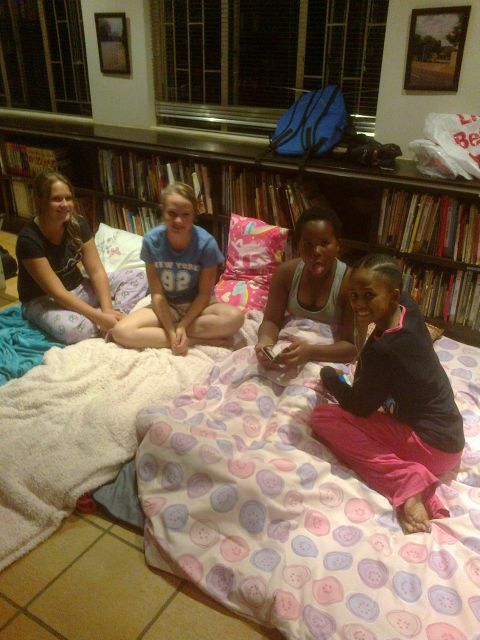 We were also joined by the girls from the OWLAG (Oprah academy). We were featured in the Meyerton Ster 27th Sept Issue. Well done to everyone who took part!! All Winners on the day!! !